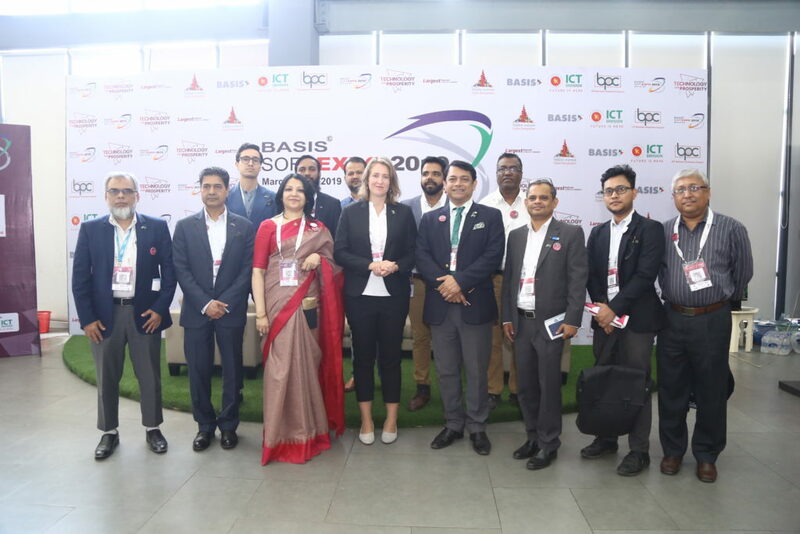 SBBC and its members Hifab, Ericsson, IndPro, QuizRR and Bangladesh Business AB visited BASIS SoftExpo 19th – 21st 2019 in Dhaka, Bangladesh. This delegation is the first Swedish initiative to open up the IT-sector and overall IT-relations between the countries. The purpose of this delegation in brief is to be on-site at the expo and to learn and explore the IT-sector in BD, and also to meet companies that are interested in meeting us. Through this experience we as a representation of Swedish companies will bring back the knowledge we gain and to further develop the business relations between Sweden and Bangladesh. Activities commenced with the inauguration of the three-day expo, followed by the opening of the various exhibitions, and ended with 48 B2B-matchmaking meetings. The expo presents an ample opportunity to represent Swedish companies and industry and convincing our Bangladeshi counterparts to invest and grow in our part of the world. On the final day, the CEO of Ericsson Bangladesh Mr. Abdus Salam, was a keynote speaker in the morning session about 5G. It was followed by a very significant moment for Sweden and Bangladesh’s ICT-sector: Sweden-Bangladesh Business Council & Bangladesh Association of Software and Information Services (BASIS) signed a Memorandum of Understanding (MoU). Ylva Festin, Head of Political, Commercial and Communication of the Embassy of Sweden was present at the signing ceremony. The potential for the Swedish IT sector to develop business relations with Bangladeshi IT companies is infinite. Bangladesh is an emerging economy with its 170 million people and strong economic progress for the last decade. The country has embarked on a mission to transition into a “Digital Bangladesh” by 2021 and each year Bangladesh continues to make strides in its digital development. The SoftExpo 2019 was the biggest one yet. The Delegation also visited the Swedish Embassy and Ericsson’s office. Mr Abdus Salam briefed us about the company’s presence in Bangladesh and some future trends in the ICT industry, particularly in regards to telecom and 5G. SBBC wants to sincerely thank all team members for their active participation and contributions during the expo and surrounding activities. SBBC looks forward to further developing our business relations with Bangladeshi companies and doing business with the our members and our network.